I will tell you I was having a bit of trouble with this. I don't do formal ABC work with my preschool class so I have never had to formally prepare anything. Then I visited Katie's post over at Katie's Nesting Spot and was blown away. As I whined about how good her post was, I came up with an idea. I told her I am so immersed in dinosaurs right now I can't think straight. 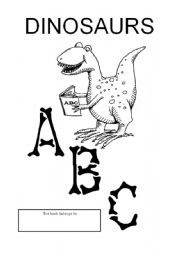 Then an idea popped into my head--I would do a dinosaur ABC. I will ask that you bear with me. I will do my best, but I don't know if I have a dinosaur for every letter. I promise, I didn't make these up. I'm hoping they are all spelled correctly. Now, I am going into hiding for the next week and DO NOT want to hear the word dinosaur the whole time:). I am dinosaured out. Wow Trish, great list! I haven't even heard of some of these dinosaurs. Isn't it funny how wrapped up in dinos some little ones get? I had a student who could not tie his shoes, count to ten, or tell me any letters but he could spell about twelve different dinosaur names and write them too! He was obsessed, I bet this is a popular theme in your classroom! holy moly! That's alot of dinosaurs! She loved publishing her own book. Your preschoolers are so lucky to have you as a teacher. You will definitely give them something to think about! What a great ABC list. My son is going to love this one. I will have to read it to him and see if we can learn a little about some of these dinos we've never explored. Thanks for linking up! Love your site. Look forward to having more time to look at everything.